I Love My Cat, But My Cat Is Destroying My Furniture! You have reached the end of your patience and you are feeling frustrated. 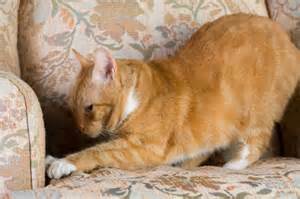 You love your cat; however, the cat has destroyed the couch with its claws. You are beginning to ask yourself, "Do have I have to make a choice between the cat and having nice upholstery or drapes?" Many people think cats scratch to sharpen their claws but that is not the reason they scratch. Cats scratch to mark their territory. Cats living in the wild choose one prominent tree and then they stretch, reaching as high as they can on the trunk, and drag their claws down the trunk. They repeat this motion over and over, leaving scratches or grooves in the trunk. In addition to the visible marks, this also leaves the scent from their footpads. For our domesticated cat family members, we must provide an acceptable, harmless outlet for this territorial scratching. Many pet stores have a selection of scratching posts from which to choose. So, we buy one, and the cat refuses to use it! the cat is using it while it is located in the spot you desire. Another reason some cats refuse to use their scratching post is the carpet on many scratching posts catches the cat's claws and makes for an unsatisfying clawing experience. Sense of touch is important to cats. They like a surface upon which their claws can dig in for a nice, smooth, continuous, satisfying drag. Therefore, recovering your post with a different type of fabric can increase the likelihood that the cat will use the scratching post rather than your drapes or chair. The sense of smell (scent) is also important to your cat. Rubbing your own palms thoroughly along the surface of the scratching post may stimulate some cats to use the post. Additionally, catnip has been used to impart a tempting scent to the post, attracting some cats to utilize the post. Conditioning takes some time and patience but it has proven effective. Conditioning your cat to use a scratching post can help save your upholstery since this territorial scratching is usually confined to a single object, like your favorite chair. When trying to change destructive or inappropriate scratching behaviors, it is helpful to consider the reason(s) your cat feels the need to mark his or her territory. Perhaps the cat feels insecure because of other stressors (i.e. increased activity or guests in the home, increased cat activity outside the home, other pets in the home, changes in the environment, addition of new pets in the home). Anything that relieves your cat's stress will reduce his or her need to mark your furniture. Hopefully, you will find this information useful. However, this information is not a replacement for a veterinary consultation. Please do not hesitate to consult with the veterinarians at Ahwatukee Animal Care Hospital for additional information and behavioral counseling, or if you would like to schedule a health care appointment.